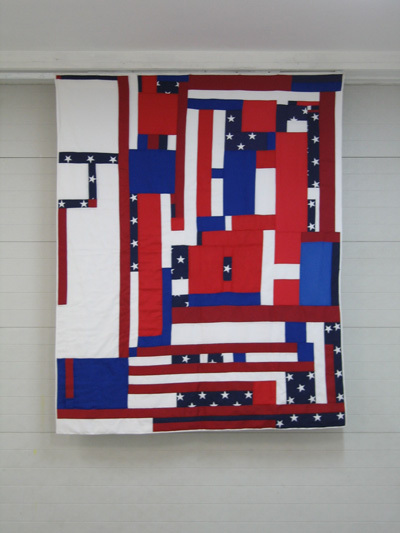 On November 16th, 2005 the work Boogie Woogie Migration, a quilt combining the Dutch and American flags, inaugurated Dutch-American Day at Utica, NY city hall. The quilt disappeared after two days, as veterans working in the building challenged my usage of the flags and complained about the apparent deconstruction of the American(not the Dutch?)flag. They didn’t listen to the explanation of my conceptual approach, nor the reference to Piet Mondrian (Dutch/American), nor to the Betsy Ross myth (scraps of red, white and blue) for that matter. I didn’t even have time to arrange a photographer. So much for freedom of speech in the land of the free and the home of the brave.